A nice colorfull decorated bird house is the perfect addition to attract birds and give your house or yard that little something extra. However, a dark place with a small hole is also a perfect place for bees and wasps. 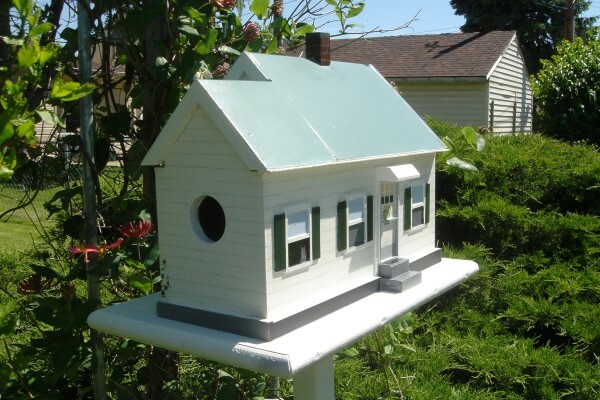 A bird house provides complete shelter for a queen to make her nest, and an easy entrance and exit for workers. Because of this, it is not uncommon to find bees and wasps living in in bird nests instead of birds. 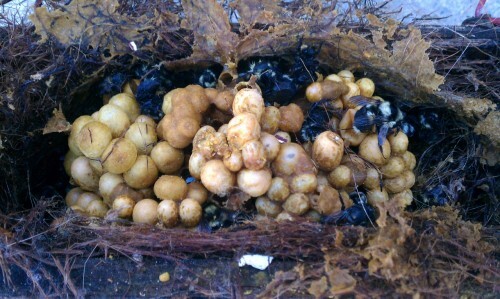 For this customer the invading pests were bumble bees. They had moved in to the customers bird house and made it their own. Having a bumble bee nest close to your home is definitely something you want to avoid. The bumble bee looks similar to a honey bee in shape, but is usually much larger in size. Bumble bees in the Auburn, CA area are black with yellow stripes, can be very aggressive if you bother their nest (much more so than a honey bee) and can deliver a very painful sting. If you find a bumbled bee near your home avoid it and give us a call! Disturbing the nest may cause the bees to attack, and bumble bees are one type of bee you don’t want to upset!